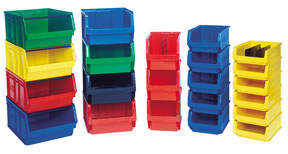 Heavy-duty plastic bins ideal for large and heavy parts. You can stack giant Magnum bins. .Double wall thickness with pre-formed lip allows bin to interlock. Stack bins up to 150 lbs.